This day is the science fair at our school, so I needed something quick and easy! My parents leave to go back to Ukraine today, so from now on, I will be including Sunday meals. Thursday ~ Happy Birthday to Me! My husband is responsible for this meal! 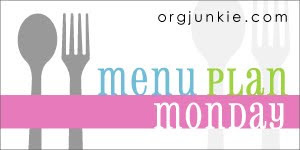 As always, check out OrgJunkie for more great menu plans! Yum! Very diverse and interesting! No one would get bored eating these meals!